The addition flashcards pictured above are part of a learning system (Math in a Flash) that stresses working at the child's pace. If you've ever used stand-alone flashcards, they can get unorganized and messy quick. I know, because right now we have one child working with multiplication flashcards while another is using addition and sight word cards. We have a plastic tub with vocabulary cards mixed with spelling cards mixed with addition and fact family flashcards. It's a mess. These cards are nice because they come with hole-punched corners and two rings for easy organization. You can use one ring for storing your cards and another for setting your child up with a specific, color-coded set of numbers to work with. These cards meet core curriculum standards of solving addition word problems, adding within 10, finding the numbers that make 10 when adding 1 to 9, and fluently adding within 5. It's best if you can work on the flashcards with your child, but I'm a parent and I know that's not always possible. These flashcards are self-checking so your child can work on them solo for those times when you get busy. 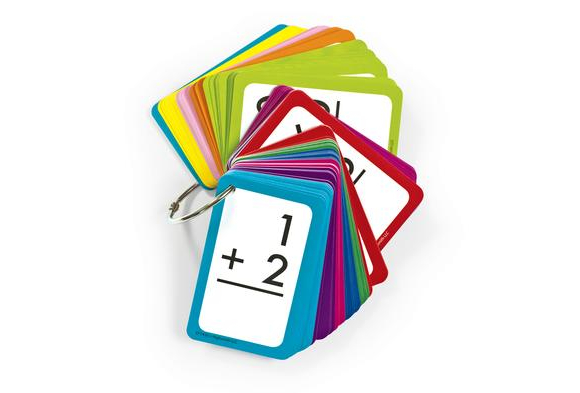 For more information or to order your Addition Flash Cards here. Don't forget to take advantage of my free addition worksheets and math lessons too. See links below. You can find more addition lessons and worksheets on the pages below. You'll also be able to print out and make your own flashcards, including addition flash cards.